This doesn’t mean that magic is considered in the same way. Much of what we do as Gaelic Polytheists may be considered to be magical in some way or another, and we can see that simple charms have were a part of everyday life for a lot of people – charms of averting, charms of blessing, and so on. 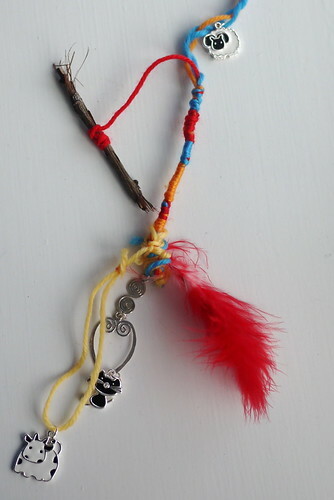 A lot of the time, the charms we might make – like the charms of rowan and red thread that are traditionally made at Bealltainn (and other Quarter Days) – are explicitly meant to protect us from witchcraft, amongst other things. The use of threads, which also feature prominently in charms to protect against or cure the Evil Eye, is not exclusive to the Gaels either, since we have mention of their use as far back as the seventh century, when St Eloi of Luxeuil (Burgundy, France) condemned their use by Christians.9 In this respect, we may regard the associations of both the rowan and the threads (as well as the belief in the Evil Eye, of course) as being likely to have been pre-Christian in origin, with the examples given below being peculiar to how the customs and associations evolved in the Gaelic homelands specifically. The Evil Eye, or otherwise the ill or uncannie ee, is a curse placed on a person or animal that can cause illness, infertility, death, delayed and dangerous births. It can cause the milk of an animal or nursing mother to dry up, and the churning of butter to fail. It may be be cast either by a witch or an unfortunate soul who is afflicted with the “Eye” through no fault of their own. In the case of witchcraft, the casting of the eye is an explicitly deliberate and malicious act. In the case of someone who may be afflicted by the ‘unsonsie glance’ it can happen accidentally, and the poor soul has to go through life very carefully, lest they accidentally cast the eye on someone.10 In some cases, those poor unfortunate people are cursed with being unable to control their power and can even bring terrible misfortune on themselves.11 More than that, the Eye may be cast upon someone by a person who is simply possessed by “…a discontented and unhappy mind full of envy (farmad), covetousness (sanntachadh) and suchlike mean feelings, and looking repiningly on the good of others, and it may too earnestly be and anxiously on what belongs to oneself.”12 Strong feelings of jealousy and envy (or other negative emotions), then, can be enough for even the most magically untalented person to inadvertantly cast the eye on someone else, so in this respect we must all be careful. The Eye can come from unexpected quarters, even ourselves. In simple terms, we might say that anyone who has a reputation for bad luck, or who rubs other people the wrong way – with a bad attitude, for example – may be accused of casting the Eye on someone who suffers some sort of illness or disaster that can’t be explained by normal means. People who have a distinctive and unusual physical appearance, such as eyes that are different colours to each other (heterochromia), may also be thought to possess the Eye. Traditionally it was women who were considered to be the main source of the Evil Eye (because misogyny, basically), but really it can be cast by anyone. Historically, those who had a reputation for an unsonsie glance were avoided where possible, and everyday life was punctuated by small rituals designed to safeguard against it – salt or silver thrown into the churn before butter was made; small children sained with silvered water, or holy water, if something malicious was suspected; an ember from the fire thrown after an unwanted visitor, and so on.13 Since you could never know when it might come, or where it might come from, it was best to play it safe. The latter rhyme specifically refers to the practice of placing both woodbine and twigs of rowan above the byre door at Bealltainn in that area. From a practical perspective, cutting the rowan at Bealltainn makes sense if we consider that cutting the branches at this time would allow fresh and young wood to be gathered, which would be at its most supple and versatile. The symbolism of the trees being in their first flourish of growth at this time of year can’t be ignored either, however, and presumably this fact – full of life and the potential for the future – adds to their potency. For a year would life belong. If what is told be our belief. In the tale of Diarmaid and Grainne, which dates to at least the ninth century in its earliest form, the couple go on the run from the wrath of Fionn (from whom Diarmaid has effectively stolen Grainne, at her insistence). In their efforts to evade capture they meet a man named Muadhan, who uses a branch of rowan, with three berries dangling off it, to capture three fish to feed them all. After leaving them, Diarmaid and Grainne go on the Slieve Echtge where the ogre Searbhan has been charged with guarding the tree of Dubhros, which belonged to the Tuatha Dé Danann. The berries were potent, “and whoever eat these berries was free from all sickness after, and felt like as if he had been drinking wine.”35 Searbhan allowed them to stay in the woods, and hunt deer, provided they left the tree alone. Grainne, however, was pregnant and began craving the berries. After trying and failing to get the berries from Searbhan, Diarmaid ultimately killed the ogre and fed the berries to Grainne himself. Diarmaid then used the berries on the tree to sling at Fionn and his warriors, but ultimately Diarmaid met a grim end. 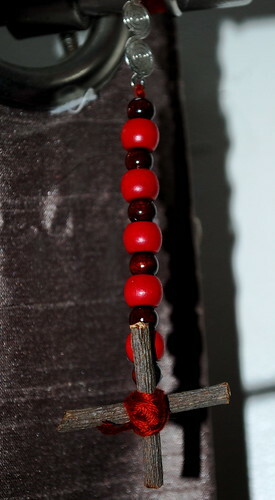 In this respect we might speculate that the custom only goes back two or three hundred years at the most, and that it perhaps demonstrates one of the most recent evolutions of the rowan’s use in protective rites, combining Christian symbolism (although the cross was equal-armed, which may not necessarily be specifically Christian) with possibly pre-Christian traditions. In Ireland the threshold charms were accompanied by withes of rowan which were then tied round the horns of the cattle. Hoops of rowan were placed around the butter churns,42 stuck in the midden,43 and a green branch was tied to the mast of boats to ensure safety at sea.44 The practice of placing a piece of rowan in the midden may reflect a pre-Christian origin, since Keating Kelly describes a similar practice being carried out in Sweden, whereby a rowan sapling was placed in the haystack on (or near) Ascension Day and kept there for the season.45 Both the midden and the haystack could be considered to have similar symbolism, since both would provide sustenance in some way – the hay to keep the cattle in milk, and the midden for use as rich compost. Berries for healing are mentioned in the trial records of an accused witch, Bartie Paterson, who confessed in 1607 to giving a man nine ‘pickles’, or rowan berries to keep on him at all times, after giving him a potion and making him fall to his knees and beg for the return of his health from “all living witches above or under the eard, in the name of Jesus.”70 In this case, the ‘pickles’ seem to have been a preventative easure, given after the cure (by potion) was performed, and is reminiscent of Maclagan’s mention of a man keeping ripened berries as protection against witchcraft and Evil Eye (see above). In the trial of Issobelle Watsonne at Stirling in 1590, she confessed to using rowan and a piece of a dead man’s finger to “cure the worm.”71 Issobelle’s fate is unknown, but clearly these methods of healing were considered to have been witchcraft – arguably because of the religious climate at the time (fundamentalist Protestantism) rather than in general. 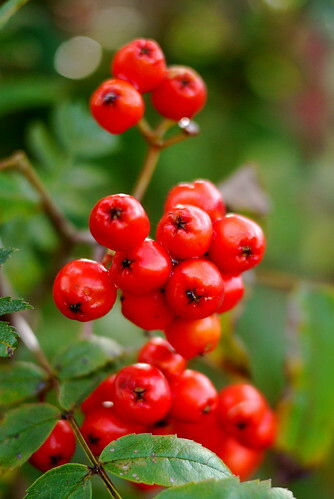 It may be worth noting, as many of the antiquarian authors did, that rowan trees are often found near prehistoric sites across Scotland, something that may have added to the mysterious associations of the wood, if it didn’t directly result in them.77 Rather, we could speculate that their inherent symbolism – the protective and vibrant red colour of the berries, so suggestive of abundance and the harvest; the versatility of the fresh wood (handy for working into various shapes and forms); and the fact that they are fast growing and leafy, an indicator of the new growth of spring; their intimate associations with pastoral and agricultural farming (given the fact that they first began to flourish as our ancestors began to clear the forests to make way for crops and domesticated livestock) – made them the perfect material for use in the charms that were made to protect the things they were so commonly found near. It seems clear, however, that the associations of the rowan go beyond being simply ‘Celtic’, since they can be found in Scandinavian and Germanic countries, too. Lucas notes that the rowan is absent from any mention in the lists of sacred trees that are found in Ireland, and are only rarely associated with holy wells, and suggests that in spite of its prevalence in folk charms, the significance of the rowan may have come from interaction with the Norse settlers.78 There was no significant contact with the Norse until the ninth century, and since the Táin Bó Fráich dates to the eighth century, for one, Lucas’ suggestion seems shaky. This doesn’t preclude a more roundabout means of transmission, however, via Britain perhaps, but nor does it mean that the beliefs associated with rowan had to have come from somewhere else at all. Here, the Otherworldly element may be the key to explaining the apparent contradiction, since the Otherworld was often portrayed as being the direct opposite of the physical world – peace where there was, plenty where there was want, and so on. Alternatively, its appearance may simply be a means of demonstrating the taboo against harming the trees; or else the colour of the berries – long associated with the Otherworld and Otherworldly knowledge may explain its use, since a frequent theme in these tales seems to be a foreshadowing, the imparting of hidden knowledge. 1 For a more in depth discussion of this subject, see Gaol Naofa’s Rowan and Red Threads: Witchcraft and Magic in Gaelic Polytheism. 2 The association with the Devil is of course a Christian belief. It’s interesting, however, that so much of Gaelic belief regarding witches and witchcraft is so stubbornly framed in Gaelic, rather than explicitly Christian, lore. 3 Black, The Gaelic Otherworld, 2005, p174; Ó Súillebháin, Irish Folk Custom and Belief, 1967, p82. 4 Wood-Martin, Traces of the elder faiths in Ireland, 1901, p156; Cheape, ‘The Material Culture of Charms and Amulets’, p81, in Fantastical Imaginations, edited by Lizanne Henderson, 2009. 5 Gregor, Notes on the Folk-Lore of the North East of Scotland, 1881, p188. 6 Paton, ‘Manx Calendar Customs (cont. ),’ in Folklore Volume 51 No. 4, 1940, p282. 7 Pennant, A Tour in Scotland and Voyage to the Hebrides 1772, 1774, p203; Black, The Gaelic Otherworld, 2005, p431; Maclagan, Evil Eye in the western Highlands, 1902, p119. 8 See for example Keating Kelly, Curiosities of Indo-European Tradition and Folklore, 1863, p161-166. And yes, technically Cornwall is a county in England and shouldn’t need a separate mention but I respect the opinion and strong feeling of the Cornish people who see themselves as sovereign and separate from the rest of England. 9 “No Christian shall attach short strings to the neck of women or of animals, even if you see this practised by churchmen, and they should tell you that this custom is a pious one.” From St Ouen’s Nos Origines, quoted in Maclagan, Evil Eye in the western Highlands, 1902, p141. 10 Davidson, Rowan Tree and Red Thread, 1949, p76-77. 11 Grant, Highland Folk Ways, 1961, p138. 12 Black, The Gaelic Otherworld, 2005, p201. 13 McNeil, The Silver Bough Vol I, 1957, p153. 14 McNeil, The Silver Bough Vol I, 1957, p153. 15 Stewart, The popular superstitions and festive amusements of the Highlanders of Scotland, 1823, p114; Dalyell, Darker Superstitions of Scotland, illustrated from History and Practice, 1834, p681. 16 Maclagan, Evil Eye in the western Highlands, 1902, p114. 17 The urine is left to go stale because the ammonia content is more concentrated. McNeill, The Silver Bough Vol I, 1957, p75; p78-79; Ross, Folklore of the Scottish Highlands, 2000, p77. 18 Evans, Irish Folk Ways, 1957, p297. 19 Henderson and Cowan, Scottish Fairy Belief, p89. 20 McNeill, The Silver Bough Vol I, 1957, p79. (The Silver Bough Vol I, 1957, p78). Gregor has it as “Gars”, Gregor, Notes on the Folk-Lore of the North East of Scotland, 1881, p188. 22 Chambers, Popular Rhymes of Scotland, 1870, p328. 23 Gregor, Notes on the Folk-Lore of the North East of Scotland, 1881, p188. 24 McNeill, The Silver Bough Vol I, 1957, p78. 25 Black, Scottish Charms and Amulets, 1892. 26 Quoted in Davidson, Rowan Tree and Red Thread, 1949, p77. 27 Bennett, ‘From Local Memorate to Scottish Legend’, p179 in Fantastical Imaginations, edited by Lizanne Henderson, 2009. 28 Danaher, The Year in Ireland, 1972, p89; Wilde. 29 Ó hÓgáin, The Lore of Ireland: An encyclopedia of Myth, Legnd and Romance, 2006, p262. 30 See Gantz, Early Irish Myths and Sagas, 1981, p114-126. 31 Ó hÓgáin, The Lore of Ireland: An encyclopedia of Myth, Legnd and Romance, 2006, p262-263. 32 Henderson, Survivals in Belief Among the Celts, 1911, p180-181. 33 Campbell and Henderson, The Celtic Dragon Myth, 1911, p20-22. 34 Henderson, Survivals in Belief Among the Celts, 1911, p180. 35 See Diarmuid and Grania, p17. 36 Gregory, Gods and Fighting Men, 1904, p369. 37 Campbell and Henderson, The Celtic Dragon Myth, 1911, p20-22. 38 Stewart, The popular superstitions and festive amusements of the Highlanders of Scotland, 1823, p260. 39 Lightfoot, Flora Scotica Vol I, 1777, p257-258. 40 Pennant, A Tour in Scotland, 1772, p170. 41 MacInlay, Folklore of Scottish Lochs and Springs, 1893, p299. 42 Wood-Martin, Traces of the elder faiths in Ireland, 1901, p156. 43 Evans, Irish Folk Ways, 1967, p273. 44 Ó Súillebháin, Irish Folk Custom and Belief, 1967, p29. 45 Keating Kelly, Curiosities of Indo-European Tradition and Folklore, 1863, p162. 46 Carmichael, Carmina Gadelica Vol II, 1900, p246. 47 Fairweather, Highland Heritage, 1984, p40. 49 Napier, Folk Lore or Superstitious Beliefs in the West of Scotland Within this Century, 1879, p53. 50 Lightfoot, Flora Scotica Vol I, 1777, p257-258. 51 Carmichael, Carmina Gadelica Volume II, 1900, p246. 52 McNeill, The Silver Bough Vol I, 1957, p78. 53 Ross, Folklore of the Scottish Highlands, 2000, p77. 54 McNeill, The Silver Bough Vol I, 1957, p78. 55 Maclagan, The Evil Eye in the western Highlands, 1902, p119; Black, Scottish Charms and Amulets, 1892. 56 Carmichael, Carmina Gadelica Vol II, 1900, p246. 57 Maclagan, The Evil Eye in the western Highlands, 1902, p119. 58 Napier, Folk Lore, or, Superstitious Beliefs in the West of Scotland Within the Century, 1879, p53; Black, Scottish Charms and Amulets, 1892. 59 Lightfoot, Flora Scotica Vol I, 1777, p257-258; Chambers, Popular Rhymes of Scotland, 1870, p328; Black, Scottish Charms and Amulets, 1892. 60 Ross, Folklore of the Scottish Highlands, 2000, p95. 61 Stewart, The popular superstitions and festive amusements of the Highlanders of Scotland, 1823, p54. 62 Davidson, Rowan Tree and Red Thread, 1949, p77-78. 63 James I, Daemonologies, 1597, p11-12. 64 Ó Súillebháin, Irish Folk Custom and Belief, 1967, p23. 65 Chambers, Popular Rhymes of Scotland, 1870, p328-329; Ó Súillebháin, Irish Folk Custom and Belief, 1967, p29. 66 Evans, Irish Folk Ways, 1957, p64; p305. 67 Cheape, ‘The Material Culture of Charms and Amulets’, p81, in Fantastical Imaginations, edited by Lizanne Henderson, 2009. 68 McNeill, The Silver Bough Vol I, 1957, p154. 69 Henderson, Survivals in Belief Among the Celts, 1911, p180-181. 70 Henderson and Cowan, Scottish Fairy Belief, 2007, p78. 71 See Survey of Scottish Witchcraft. 72 McNeill, The Silver Bough Vol I, 1957, p154-155. 73 Black, The Gaelic Otherworld, 2005, p204/p450. 74 Black, The Gaelic Otherworld, 2005, p431. 75 From 1814, quoted in Davidson, Rowan Tree and Red Thread, 1949, p77. 76 Presumably this remedy was effective in the cases of blocked milk ducts, where milking would help relieve the blockage. Fairweather, Highland Heritage, 1984, p40. 77 Lightfoot, Flora Scotica Vol I, 1777, p257-258. 78 Stewart, The popular superstitions and festive amusements of the Highlanders of Scotland, 1823, p210. 79 Stewart, The popular superstitions and festive amusements of the Highlanders of Scotland, 1823, p210. 80 Gantz, Early Irish Myths and Sagas, 1981, p45. 81 The Death of Cu Chulainn.